One of our own recently returned from a relaxing vacation in Vietnam. She was kind enough to share some of her pictures and experiences with us! This is How We Travel. Vietnam was the first stop on a five-week trip for us, and it couldn’t have started better! Having never been on a Vietnam tour before, we wanted to explore some of the country’s highlights and cover the northern, central, and southern region of Vietnam. First stop was Hanoi. After arriving late in the afternoon we explored the Old Quarter, stopping at a small food stall for some of the best pho we’ve ever had! 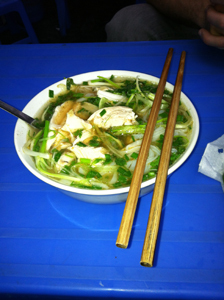 Don’t miss out on the opportunity to eat street food in Vietnam. Often times the pho we had for about a $1 on the street was much better than what was available at restaurants. After wandering around the unique shops in Hanoi we ventured to Hoan Kiem Lake, or Lake of the Returned Sword, which was about a five-minute walk from our hotel. Upon returning the next day with our guide we learned more about the lake and the legend behind it. 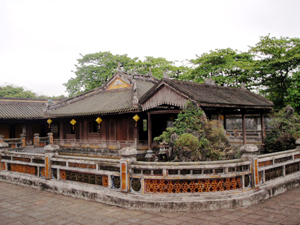 Hoan Kiem Lake is regarded as the center of the city and according to the legend during the time Vietnam was occupied by the Chinese a resistance leader named Le Loi found a sword while fishing in the lake. The sword led Le Loi to victory and resulted in the expulsion of Chinese forces from Vietnam. Upon returning the sword to the lake a giant tortoise emerged to take the sword back, hence the name Lake of the Returned Sword. There are still a small number of tortoises in Hoan Kiem Lake and it is considered good luck to spot one. Unfortunately we didn’t see any of the giant turtles. Early morning is a great time to visit the lake and you’ll see many people exercising, everything from jogging to tai chi. After exploring the highlights of Hanoi with our guide, including Ho Chi Minh’s Mausoleum, the Temple of Literature, and the Ethnology Museum, we started the journey to Halong Bay. The drive to Halong Bay was incredible. During the 3-hour drive I enjoyed watching the countryside and seeing some of the truly local areas of Vietnam. It must have been wedding season because our guide kept pointing out wedding tents and parties along the drive, and informing us of some of the Vietnam wedding traditions. Though the weather was not ideal at Halong Bay, with some fog and mist, our small cruise ship was a great way to experience the incredible UNESCO World Heritage Site. We visited some of the caves, enjoyed delicious seafood, and explored a lagoon where we watched and fed monkeys living on the limestone karsts. On the way back from Halong Bay we stopped on the side of the road to take pictures in an area known for their vegetable gardens. The colors and scenery were incredible. 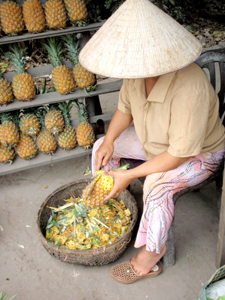 We also stopped at a pineapple stall on the side of the road for a delicious and cheap snack before our evening flight to Hue. Our first day in Hue started with a cruise along the Perfume River to the Thien Mu Pagoda. We spent a whirlwind day in Hue visiting the ancient citadel, the Royal Tomb of Emperor Minh Mang and Emperor Khai Dinh and Dong Ba Market. During our visit the Hue festival was occurring so there was a large celebration at the citadel later that night with cultural performances from Vietnam and around the world. 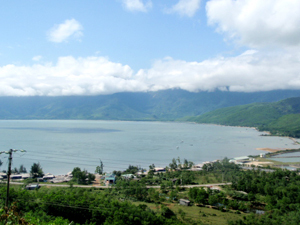 We had another picturesque drive from Hue to the coastal town of Hoi An. We stopped at Lang Co beach for a quick photo op before heading up the mountain pass of Hai Van; we also stopped for some photos on the way down. 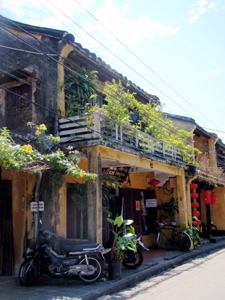 The hotel in Hoi An was one of our favorites of the trip. Bamboo Village Beach Resort is located just outside of town on a river, and provided the perfect relaxing environment after our busy days in Hanoi and Hue. We spent the next couple of days relaxing by the pool, strolling through the ancient town of Hoi An, and going on bike rides to the beach. Bamboo Village has bicycles and motorbikes to rent, though you can also walk to town in about 20 minutes. After a few lazy days in Hoi An, we flew to lively Ho Chi Minh City for our last stop. 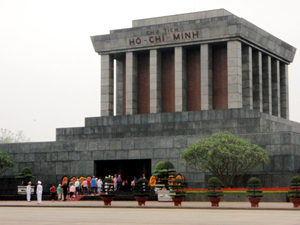 Our guide showed us all around the city, with stops including The Museum of War Remnants, the Jade Emperor Temple, China Town, and Binh Tay Market. One of my favorite ways to experience a new city is to visit the local markets and experience the wide array of food sold, see where the locals shop, and take in all the unfamiliar sights, sounds, and smells. 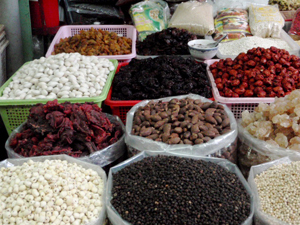 We visited local food markets in Hanoi and Ho Chi Minh. China Town in Ho Chi Minh provided us with a plethora of pictures of local vegetables, spices, and other foods. 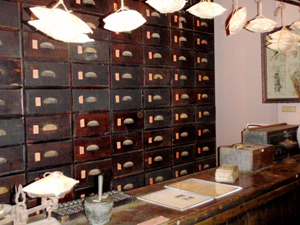 We also visited The Museum of Vietnamese Traditional Medicine in Saigon. Simply to see the architecture and design of the museum is incredible, and learning about the history of medicine was fascinating. The museum has a ground floor and five upper floors. As the museum is relatively new, we had it completely to ourselves, with a guide from the museum to show us around and explain the history and displays. Our last day in Vietnam was a free day, so we headed to Binh Tay Market to pick up a few gifts and souvenirs. Like much of Asia, bargaining is the norm at Binh Tay Market and you can find inexpensive clothes, bags, decorations, and more. Exhausted from all that shopping we decided it was time for a cocktail. Our guide in Ho Chi Minh City suggested we go to Hotel Equatorial and have a cocktail at the rooftop bar, Saigon Saigon. Though the cocktails were a bit pricey, it was well worth it to enjoy watching the sun go down over the city. 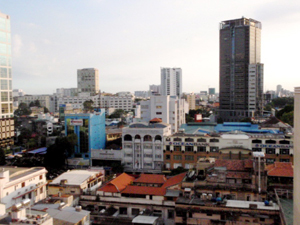 You can also go to the tallest building in Ho Chi Minh City, Bitexco Financial Tower, to experience a higher viewpoint. 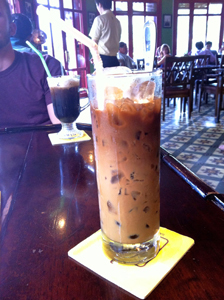 The next morning we enjoyed an iced Vietnamese coffee before hopping on our plane to Thailand. With just 12 days, a custom Vietnam tour was the ideal way for us to experience the whole country without feeling overwhelmed. 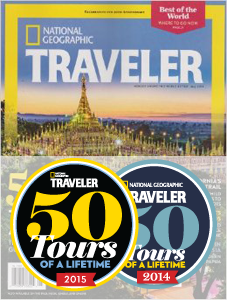 With private guides we had more flexibility in our sight-seeing schedule and were able to learn about many aspects of Vietnamese culture, as well as pick up a few local tips and suggestions. Our itinerary was the perfect introduction to the country and we can’t wait to go back to explore some of the stops we missed as well as some of our favorite cities!